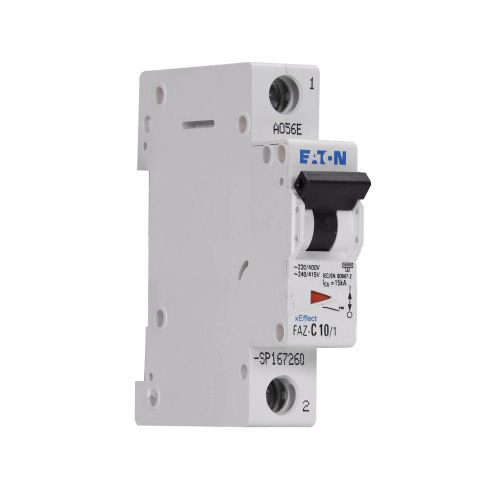 Eaton FAZ Series 1-Pole Industrial miniature circuit breaker is rated at 10-Amps and 277-Volt AC/48-Volt DC. The interrupt rating of this circuit breaker is 10-Kilo-Amps. It has dimension of 3.5-Inch x 3-Inch x 1-Inch. This current limiting circuit breaker with screw terminal connection, accommodates one 25 (18 - 4-AWG) or two 10 (18 - 8-AWG) conductors. It employs instantaneous C-curve (5-10X In) and thermal-magnetic trip for ensuring reliable performance. This circuit breaker supports DIN rail mounting, therefore making installation easier. It features nylon housing and withstands temperature range of -40 to 75 deg C.
This circuit breaker is perfect for feeder and branch circuit protection in internal/external convenience receptacle circuits, small transformers, motor control circuits, control circuits, load circuits leaving the equipment, internal/external HACR equipment, computers, power supplies, control instrumentation, pilot devices, relays, UPS and power conditioners. Circuit breaker is UL listed, CSA certified and VDE/ABS/RoHS compliant.